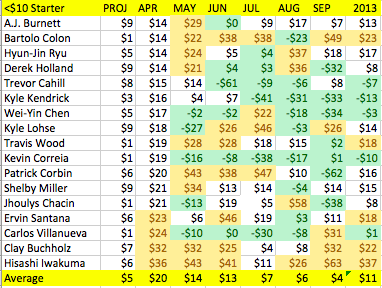 This chart shows the 15 starters who had the worst April last year, and how it went afterwards. Only Rick Porcello and Jason Vargas almost climbed out of the hole they’d dug themselves into. Some of these guys aren’t starters, or didn’t remain starters for long. I own Edwin Jackson in Tout Wars this year, and am not sure that I can wait until July for the hot streak that will commence the moment I spurn him. 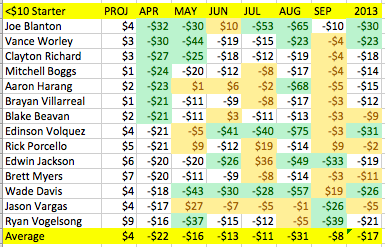 The chart of April Winners from 2013 shows a surprising amount of green, which indicates poor performances. It’s definitely seems better to go with the pitchers who have a hot April start.